I hope everyone had a great Christmas and New Years. 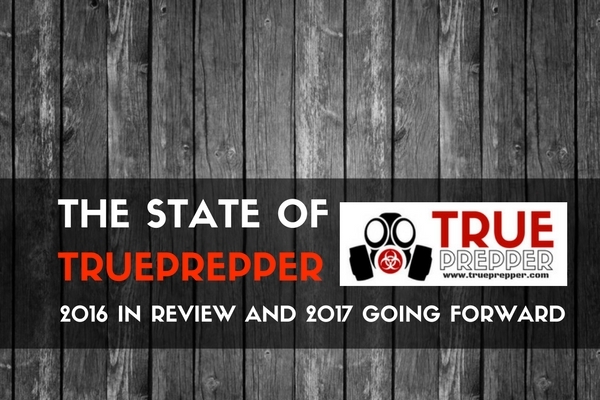 While reflecting on TruePrepper for the New Year and setting goals going forward, I thought it might be a good idea to share how we’ve been doing this past year. We’ve made a few friends along the way and networked with several other prepping sites that share our frame of mind. While 2016 seemed good, 2017 should turn out to be even better. FJ – The old man of the group, FJ is the most experienced of us all and has been prepping for most of his long life. He is a veteran, HAM enthusiast, and a woodworker among other things. He is world-traveled and the most prepared out of all of us by far. AC – An eagle scout, great cook, and staunch environmentalist makes AC a great addition to the team. He is brimming with enthusiasm to share his ideas ranging from global warming to basic wilderness survival. EG – Currently serving in the armed forces, EG is the one you want on your side when SHTF. He de-escalates dangerous situations on a regular basis. He has extensive first aid training and can drive almost anything, land or sea. He excels in lifestyle fitness and combat tactics. 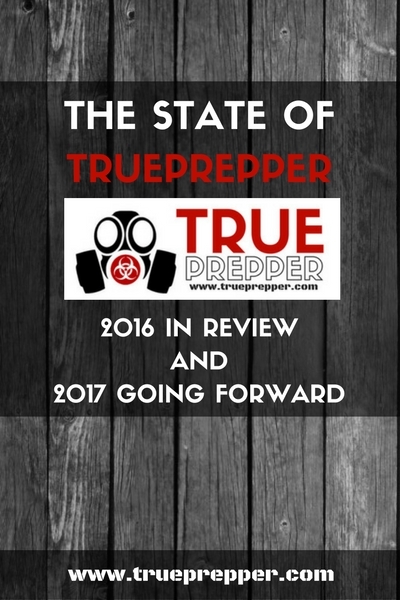 A great resource to share ideas for TruePrepper. I would like to take this opportunity to formally welcome these three hard chargers to the team, and I look forward to them helping us grow and become more well-rounded. Also, in 2017, we plan on continuing our giveaways and have some great partnerships and products lined up to give our readers for free! Our goals include hitting the top 10 on Top Prepper Websites. In the past year we have climbed to the top 25 with the amazing support of our readers. Another goal for 2017 is to hit one million views. Finishing 2016 with ¼ million leaves us with a long way to go, but we believe it is attainable. We are looking to have more great quality articles, and even more in depth reviews on a large variety of survival gear. 2016 was a good year, and 2017 is looking up. If you are reading this, we would like to thank you for your support, and invite you to come back and check up on us often! Keep exploring, stay prepared, and be safe. I would like to see an really IN DEPTH article about building security into your home or retreat. For instance: security landscaping, concrete planters for cover in a firefight, creating and using slopes and mounds of earth to your advantage, tactical planting of shrubs, bushes and “prickly-nasties”, intentionally building a long weaving , curving driveway to slow-down the approach of someone who might be unfriendly, dragons teeth that don’t look like dragons teeth, reflective light sources that cannot be shot out by snipers, ballistic-proof walls and glass. I for one would really like to read more on this topic from someone who has new ideas I haven’t thought of. Thanks! Thanks for the feedback! You touched on some really sound ideas to start us off and I’m sure we can put our heads together to get a comprehensive post on the best things to consider when implementing a security plan. We will give it our best in the next month or two, so be on the lookout.